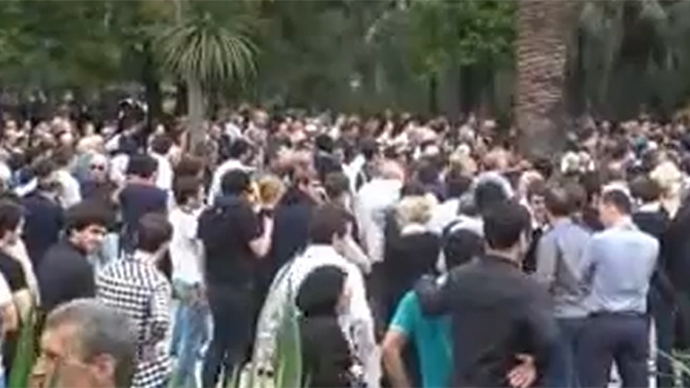 Up to 5,000 anti-government demonstrators have gathered in Sukhum, Abkhazia to demand reforms and the resignation of the president and government of the partially-recognized republic in the South Caucasus. Tuesday's rally in the center of the republic’s capital was organized by a united opposition which claims the government's actions could ruin the country. “The country is drifting as it leans only on external aid, having neither understanding nor a plan for future development,” said Vitaly Gabnia, chair of Arua veterans organization, as quoted by local news portal Nyzhnaya Gazeta. “A country cannot be sovereign when two-thirds of its budget is formed by another state’s subsidies,” he added, referring to Russia’s financial assistance to the republic. Demonstrators also blamed authorities for alleged misrule, corruption, and stagnation in the country and demanded the resignation of the government, the prosecutor general, and the heads of two regions. They also reportedly urged the resignation of President Aleksandr Ankvab. Opposition leaders then met for talks with Ankvab which lasted for about two hours. During the negotiations, a crowd of demonstrators blocked the administration building, calling on the president to come out and talk to them. Ankvab supporters also gathered at the site. Itar-Tass reported that several people were injured when the situation grew violent. However, RIA Novosti reported that there were no clashes between the two sides. Following the talks with the president, Raul Khadzhimba – head of the Forum of Abkhazia People's Unity party – addressed demonstrators, saying that the opposition Coordination Council would take interim leadership over the republic. The statement was met with applause. However, a senior administration official told Itar-tass that the government is in control of the situation in Sukhum and in the republic in general. The unnamed source denounced media reports that Ankvab had already agreed to dismiss the government. The official confirmed that the issue was discussed at the meeting but that talks were interrupted as some demonstrators attempted to break into the building. Police and Ankvab supporters managed to force the activists out, the source said, underlining that weapons were not used. However, no photo or video evidence of the alleged break-in was shared through any news outlets or social media. Following the incident, the president reportedly stopped the talks, saying that he was only ready for a civilized discussion and would not make any decisions under pressure. According to Itar-Tass, talks will resume on Wednesday. Ankvab was elected president of the Black Sea coastal republic in 2011, having earlier served as the region’s premier and interior minister. Throughout his political career, he has survived several assassination attempts and has been wounded twice. Russia officially recognized the independence of Abkhazia and neighboring South Ossetia in August 2008, shortly after the so-called “Five Days War” which started after Georgia attacked the South Ossetian capital of Tskhinval.